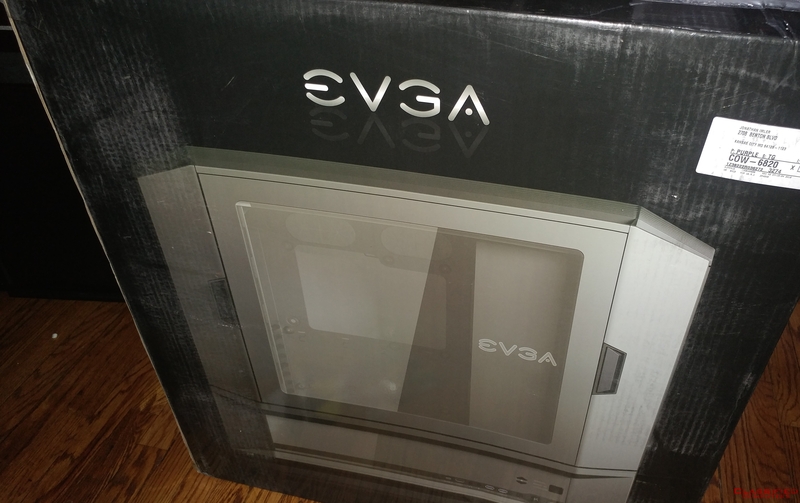 Today we will be reviewing the DG-8 Series cases from EVGA, More specifically the DG-86 model. On paper, it sounds pretty impressive. 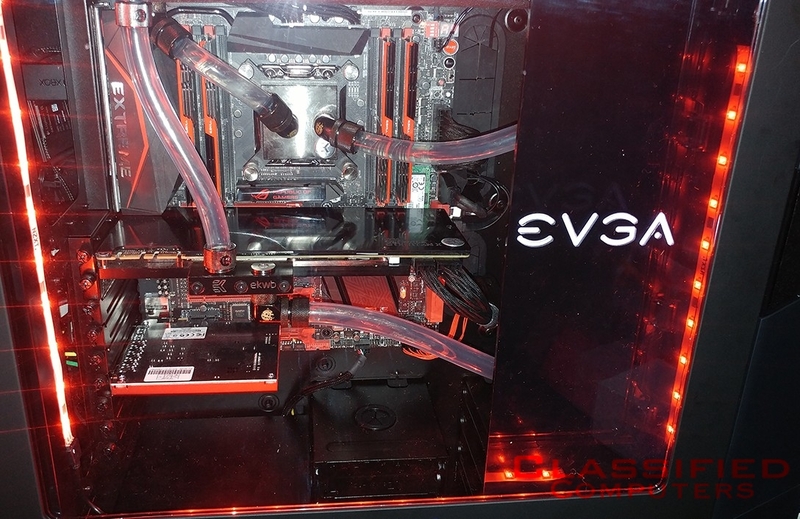 Supporting native watercooling reservoirs (from EK only), Built-in LED Temperature display, 12 SSDs/HDDs, eight 120mm fans and two 360mm radiators. It really shines with the purpose of watercooling. So that’s exactly what we did, rebuilt our flagship system for strict purposes with this case in mind. 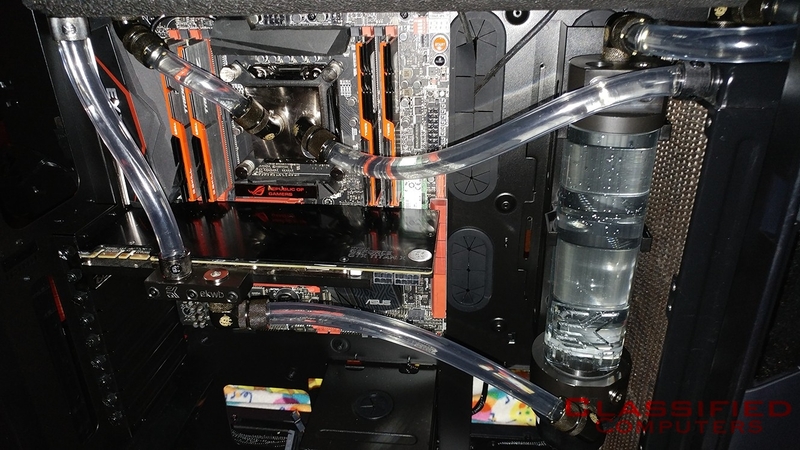 Here is the watercooling equipment we are using in this build. We have 8 Delta fans (FFB1212EH-PWM), EK-RES X3 with a XSPC D5 Pump, A Coolgate G2 360 radiator, a Black Ice GTX360 Radiator. 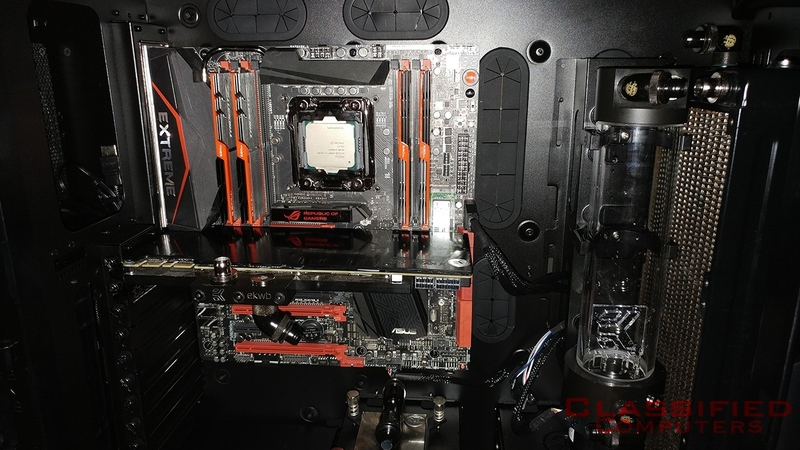 We’re also using a EK-Supremacy EVO X99 Full Nickel CPU waterblock with a EK Titan X (Maxwell) waterblock. 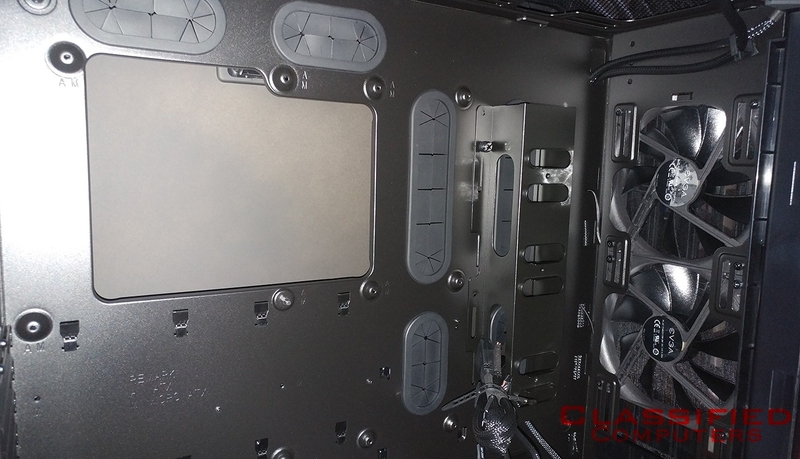 We have the Coolgate G2 in the front of the case and the Black Ice GTX 360 mounted to the top of the case. 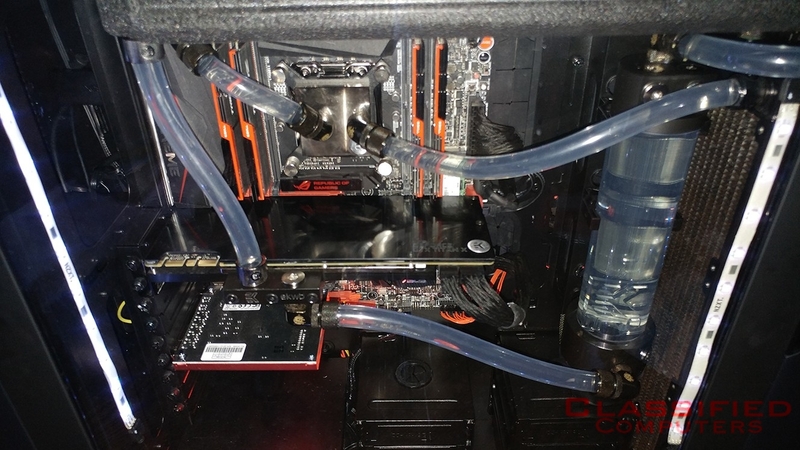 Let’s start with some problems we encountered during construction of the watercooling system. 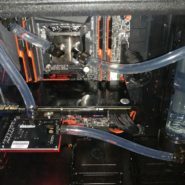 Since the Coolgate G2 is a 65mm thick radiator (the standard 120mm fan is 25mm thick), we had some issues putting the EK-RES X3 reservoir behind it. If they could move the bracket and bracket mounting holes 25mm – 35mm to the left, maybe fold the bracket’s mounting fins back onto the rear of the bracket, slim down the bracket itself. It would free up a lot of room. 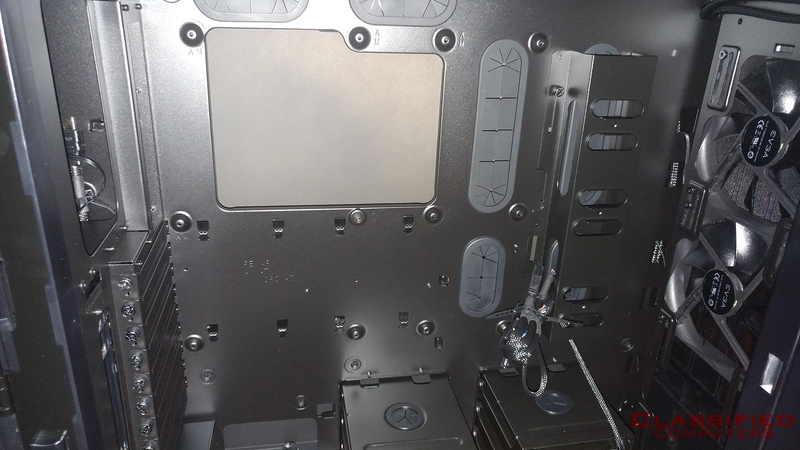 Another aspect we saw are the 6 HDD bays on the bottom is quite a lot. Maybe slim it down to four down there, make them hotswappable. 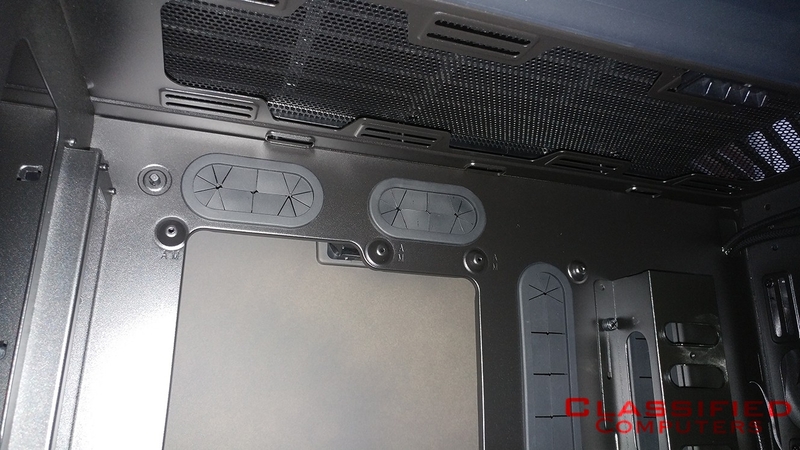 Since you have two 3.5inch trays behind the motherboard, and four 2.5inch trays also. Lower the power supply shroud down a inch. Lower the motherboard area so the top radiator can run push/pull fans. I might be just rambling now but I think it would help, along side of moving the LED Readout and HDMI/USB/Buttons area over to the PSU side (with 90 degree cables on everything). That would also help wire management, which is pretty bad under that front radiator that’s being shared with a drain valve. One of our leading complaints about the case is the weight. Weighing in at 51lbs bare (nothing else in the case), I can’t even begin to imagine the weight after everything is added. But it was severe enough we had to get a dolly to move the case around easier. I would think having a case of this weight would also cause the frame to warp under the force. 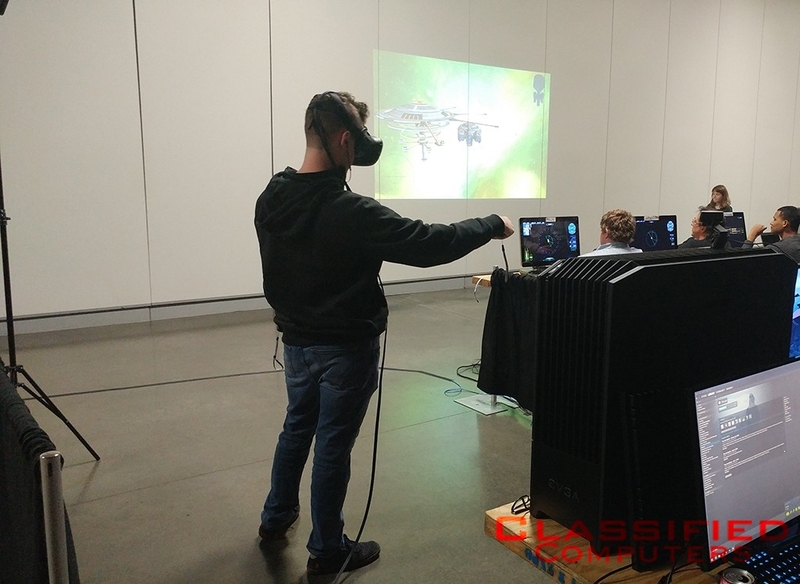 There are good aspects as well though, such as plenty of storage room, customization options concerning watercooling, EATX support and more. Most of the case can be broken down to parts you can paint. The main part that needs to be corrected to allow this is the bottom mirror/HID/display panel. It can’t be disassembled to be painted. It’s also very hard to replace some of the components in that area. Another aspect is the side plexiglass panel can’t be customized because of it being a single piece. So overall, we can’t give this case a Classified Computer’s approved seal. But we can say it passes the bar. We would probably recommend this as a home server case, something you wouldn’t really take/show but keep stationary and at home. Reviewer notes – To compare the sizes. 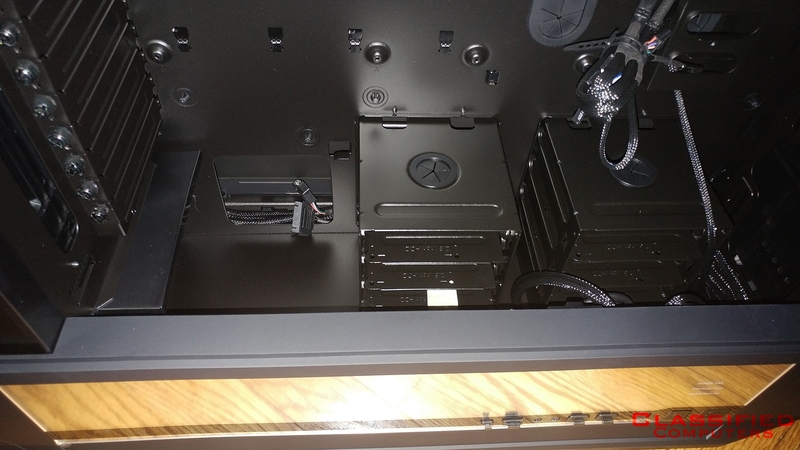 Corsair’s 900D is 41lbs, CaseLabs SMA8 is 27lbs, Rosewill CULLINAN is 24lbs. So the DG-8 weighs in heaviest case of it’s class. 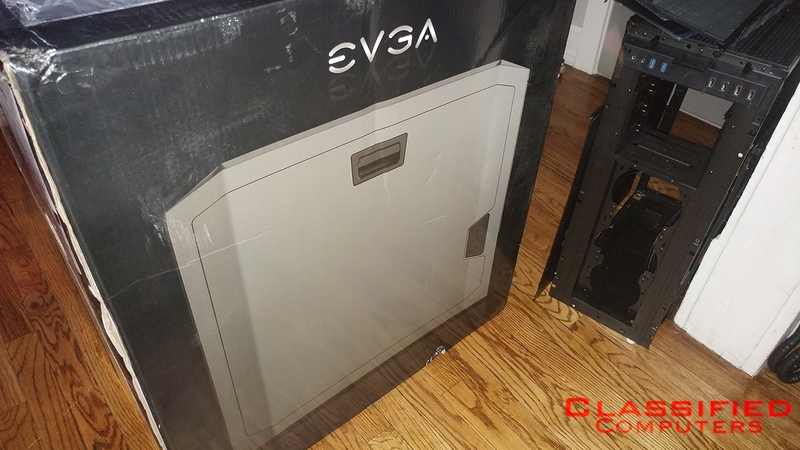 This product was given for free to us, There were not expectations between EVGA and us besides we review the case and show it off as a build at a local LAN Party. The outcome of this review was not predetermined.